The fitness industry is an ultra-competitive one. There is so much information available online these days, along with a plethora of products and services that all make similar promises to the exact same target consumers. How can you cut through the clutter and prove that you are offering something different? The first priority is to make sure that your website is ready to be your ultimate “silent salesperson” – Here’s the 5-step process you can follow to help you turn your website visitors into qualified leads. A really effective “selling” website will quickly allow your visitors to know, like and trust you – That’s an absolute prerequisite before anyone will ever consider buying the products and services you sell. But what comes next in your personal trainer marketing plan? How can you foster a relationship with new leads without spending hours emailing back and forth? As I discussed in this article about effectively selling via your website, an email autoresponder service is a crucial tool that can save you time by sending preformatted emails to people who have expressed interest in what you have to offer on your website. I use Mailchimp for my email services but there are other options such as Aweber, Constant Contact, and many others that provide similar functionality. Before we begin, just know that there is a bit of time required to set up an effective email autoresponder. But, once it’s up and running you can sit back and let it do its marketing job: It will foster relationships with your leads and turn them into paying customers! 1. Create an Opt-In Form: This form is placed on your website and allows visitors to “opt in” by entering their email address. Typically they will do this in exchange for a free gift (a.k.a. a lead magnet) of some sort. For example, you might offer a weekly workout guide, or a meal plan for losing weight, or something else that would interest your prospective clients. 2. Create a Mailing List: This is the list that your leads will be added to when they opt in to receive your lead magnet. 3. Create Your Autoresponder Series: This is a series of emails that will automatically be sent to new leads over a specified period of time. This setup process is pretty straightforward (again, any email service will offer detailed instructions as to how you can do this quite quickly), BUT the content of your autoresponder series is what will set you apart from your competitors and generate the sales you’re looking for. Your marketing emails need to stand out. What will make yours especially useful or unique? A boring, irrelevant, or unwanted email ends up in the trash pretty quickly – That’s why you need a strategy to make sure your follow-up emails are opened, read, and acted upon. I cannot emphasize this enough – Do not rush the creation of your email autoresponder series. You have worked hard to generate a new lead so the last thing you want to do is to un-engage them (or worse yet, turn them off altogether) by sending poorly written automatic emails. The first autoresponder email (which should be sent immediately after a lead opts in) is by far the most important. Your lead is eager to receive the free gift they just opted in to get – This is your best opportunity to create a strong connection and impress this potential customer. Do you notice what’s NOT included at the start of this email? That’s right – there’s no link to the lead magnet! If you begin your first autoresponder email with a link to your lead magnet, there is a good chance your lead will download the gift and immediately stop reading the rest of your email. Instead, I tell a story. This story helps my lead get to know, like, and trust me (notice a theme here?). The story continues to describe what I’ve learned and how I’ve become THE expert in my field. Once the reader understands that I know what I’m talking about, I deliver the lead magnet link they are looking for. You can follow this same formula. Why are you THE expert that your leads can know, like, and trust? What do you want every prospective customer to know about you? Tell this story and then deliver your lead magnet as promised. Your customers want to know about YOU. Let them in by sharing your story! Finally, tell your lead that you will be back with something else that they don’t want to miss out on. It could be an article you’ve written, a special offer, or anything else that holds tremendous value to your lead. I like to include this as a “PS” at the end of my first email. It’s a hook that will make your lead MUCH more likely to open the next email in your autoresponder series. Build some anticipation and your leads will actually look forward to getting emails from you! Now that your lead magnet has been delivered, it’s time to move your prospective customer a little closer to making a purchase (or at least considering making a purchase). In your second automated email (which I recommend sending 24 hours after your first goes out) you want to accomplish two things: First, you want to actively engage your lead. Someone who was interested in healthy breakfast recipes is very likely to have thought about this question before. Why can’t they eat healthy meals every single day? Your goal is to tempt your leads to reply so that a personal connection is established. As I described here, once they send you a response you are in! You’ve just made a new friend and have gained a very good prospect for future sales. Second, you want to continue building your authority or trustworthiness by delivering on the “hook” you teased in your first email. Send a link to the article, video, e-book, or whatever else you mentioned in the previous email. Make sure this resource is top-quality. Sending your very best material is a surefire way to impress your leads by giving them something unexpected that makes their life better. Prove yourself by creating only top-quality resources, even those you give away for free! Selling can be any action that you want your lead to take. This could include actually making a purchase, but it could also be meeting you for a consultation, calling you on the phone, or anything else that moves your leads closer to the end goal of becoming a lifelong paying customer. My sales pitch asks leads to register for a webinar. I’m not asking for any money (yet), but am moving our relationship along to the next step. Your sales pitch may be much different but I encourage you to think carefully about what YOU would be willing to do if you were the lead receiving this email. It’s unlikely that you would purchase a personal training package that costs hundreds of dollars – It’s too early to ask for such a commitment. What sales pitch would be appropriate? 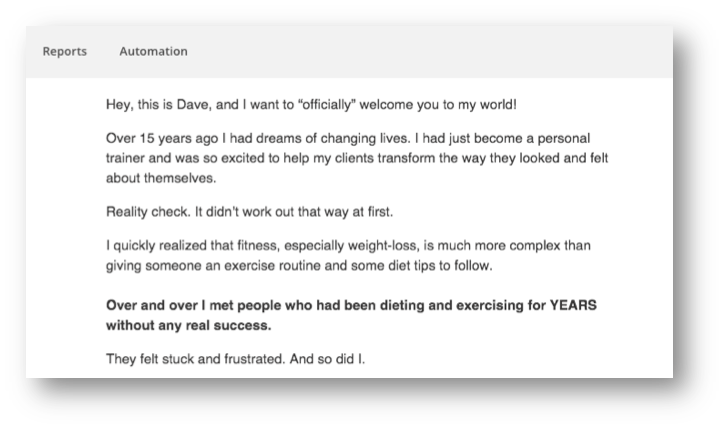 “I know you’re interested in getting back in shape so I wanted to send you this amazing fitness package I’m offering right now. Right now you can get 3 personal training sessions for the price of one, plus a free consultation to get started. Again, ask yourself what sales pitch would be appropriate for leads who have just begun to interact with you and your business. Being overly aggressive can damage the relationship you’ve begun to build with your new leads so take things slow and focus on offering value, not simply making a sale. Effective personal trainer marketing doesn’t have to be rocket-science. Build your 3-part autoresponder series today and start converting your leads into loyal fans and lifelong customers! Are you already using automatic emails? What types of email work best for you? Share your experience with us by leaving a comment below! Dave Smith was chosen as Canada's Top Fitness Professional for his innovative online fitness coaching found at Make Your Body Work. He now teaches other fitness professionals how to build their own profitable online businesses. Learn more at the Online Trainers Federation. All content copyright TotalCoaching.com © 2016 • All rights reserved.